Share on your favourite social site. This beautiful panel was specially designed for the reordered church of SS. Peter & Michael, to form the dorsal centre-piece of the sanctuary. It measures 7 feet by 4 feet and was installed following the reordering of the church in 1985. The design is based on several thematic ideas. 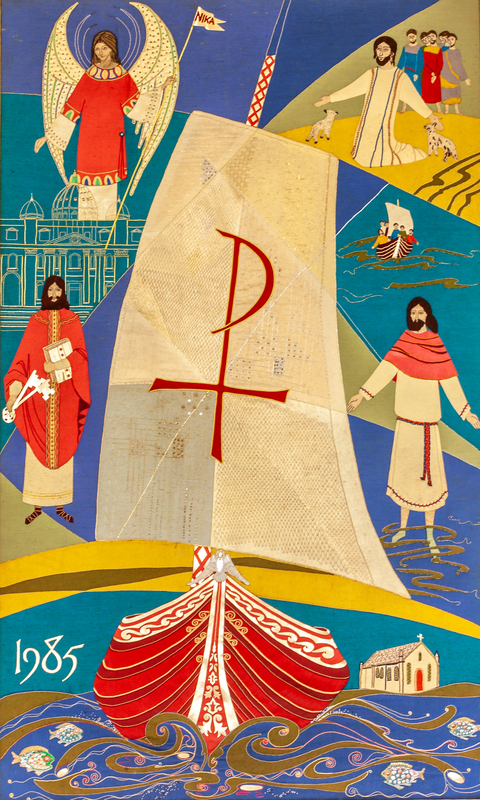 The ship at the centre of the panel represents the Church, continually moving forwards, with Christ symbolised by the Chi Rho sign placed centrally on the main sail. This ancient Chi Rho sign was adopted by Constantine in A.D. 313 and placed on the Imperial Standard of Rome. On the prow of the ship there is the Holy Spirit as the constant guide of the Church. In the waters below, Peter's fish can be seen leaping among the waves. In the vignette pictures bordering the ship are several portrayals, all parish associated. First, is portrayed St. Michael, the Archangel, bearing the standard NIKA, meaning Jesus Christ King and Leader. He is depicted blessing and guarding the Basilica of St. Peter. St. Peter, the Apostle, is depicted in three scenes. As the first Pope, he is seen holding in his hands the Book of the Gospels and the Keys on the lakeside of Tiberius, with his fellow disciples, receiving 'the command of Christ "Feed my lambs, feed my sheep", after his triple protestation of love of his Master; and walking on the waters towards Christ while the other disciples watch from the boat. Finally, the church of SS. Peter & Michael is shown in the bottom right hand corner, with the anniversary date 1985 in the left corner. The whole panel, colours and design, was executed with the intention of linking with the existing mosaics on the walls of the church. The panel was designed by Sr. Anthony, S.N.D. Art Director of the Metropolitan Cathedral of Liverpool, and the embroidery was carried out by seven ladies belonging to the Studio of the Cathedral: Miss I. Doran; Miss B. Lunt; Mrs. M. McGuinness; Sr. Margaret Xaveria, S.N.D. ; Miss M. Scanlon and Miss A. Taggart. It took five months to complete, and it is almost impossible to calculate the total number of hours spent on the work. For the technically minded, it is a combination of applique, embroidery and beadwork, and was worked in sections before the whole panel was assembled.